Call attention to your business with this gorgeous promotional product! 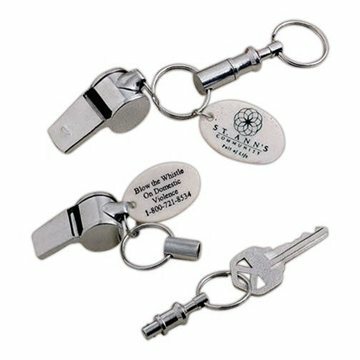 Great for sporting events and personal safety, this silver-tone whistle comes with a pull-a-part key holder and quick release button. With your company name, message or logo printed on the accenting disc, these helpful accessories are ideal giveaways at trade shows, fundraisers, conferences and conventions. Also great as tote bag inserts or safety program freebies! We've been very happy with the product. I trust that you'll have this item available for a good while (like years). Very beautiful !!!!! Everyone was very pleased to receive this gift. theses are really nice The printing came out good. the products were great, they look nice! Everyone loves this product. No problem with the product at all.